Known as America's Money Maven, Patrice Washington is a nationally recognized best-selling author, transformational speaker, and a leading authority on personal finance, entrepreneurship and success for women and youth. She's had tremendous success with her “money mindset” approach to personal finance and is committed to redefining the term “wealth”. Patrice’s wisdom on money matters has been tapped as a recurring voice by national brands such as NBC, FOX News, Black Enterprise, The Huffington Post, Essence Magazine and more. She’s most known as the personal finance voice of the top-rated and nationally syndicated Steve Harvey Morning Radio Show where she hosts her own weekly segment, Real Money Answers with Patrice Washington. In today's conversation, Patrice and I discuss the truth about wealth and why wealth is so much more than money. How you go about cultivating 100% belief in yourself today – and on all sides – mentally, physically, spiritually and emotionally? Share what it means and what it feels like to be a black woman in 2018? What do you mean when you say “wealth is more than money”? Why do you think so many of our women aren't taking care of themselves and focusing in on their well-being? There's always someone watching you who has the power to bless you. It's about showing up every day and being the best that you can be. We're on this hustle and grind and work 24/7 — we don't sleep, we don't rest, we don't take care of ourselves, we don't eat well. How can you expect to walk into such a big vision, if you're not protecting the vessel that's needed to get to the vision? One of the biggest things that I credit with my success today, was going to sit on a couch and talk to someone about my childhood trauma. You will continue to sabotage your own success and ability to build wealth, if you do not deal with some of your trauma. What it feels like to be a black woman in 2018: For all the advances we've made in education and entrepreneurship, we have so much healing to still do. So much of what we see on social media is because we're craving the validation and affirmation of people that we don't even know. Because we don't get it on the inside that we were created in God's image. I don't believe in chasing money, I chase purpose. I don't believe in just chasing opportunities just to say, “I did it.” I chase what feels right in my spirit, what feels right in my heart. I'm down for all brown children. I do always try to encourage any parent under the sun, in my voice, to just be intentional about how you love on brown babies. Be intentional about how you love on brown babies; and don't assume that they understand that there’s going to be people who don't like them just because of their anointing, and they have to be prepared with how to deal with that. I want people to know that wealth is more than money and what we should be striving for is well-being and money is going to become the byproduct. Today my self-worth is so much more than my net worth. And my wealth today is in God’s promises. My wealth today is in my wife who stuck by me in the darkest valley and went on to bless me by making me a father to two amazing little people. Wisdom is about the application of knowledge: Do you know when and where and how to use what you know? I didn't do bad deals. I just didn't always do wise deals. They didn't have a greater purpose. Wealth is the condition of well-being, in other words, happiness or fulfillment. How are you defining wealth today? You don't have to not sleep at night. I'm not saying that you don't have to work hard, but you don't have to run yourself in the ground and ruin every relationship that you have and neglect that still small voice that is trying to get to you and take a job that's outside of your purpose when you know that's not what you're called to do. Lack of fulfillment is what leads to financial mismanagement. If you work on being fulfilled like the true definition of wealth says, and all these areas of life, everything that you want will be added to you. If you would stop making it all about money, all the money you want will come to you. So many of our women aren't taking care of themselves and focusing in on their well-being women. We are so conditioned to take care of and save everyone else but ourselves. The Superwoman Syndrome — you make it work, you make things happen. But so often that comes to our own detriment. We worry about everyone else, and we come second. Wonder Woman … should have power and strength and be strong as a man but have the grace and poise and peace and ability to love like a tender woman. These expectations make women suffer in silence. Wonder Woman … We're the ones that everyone depends on, but then where do we go? For the women that I support, I just want them to know that I feel you, I hear you, I see you, I understand what that's like, and the answer is not another raise or promotion. Decide that you're ready to be wealthy! Make a choice. Everything comes with a decision. Each year Patrice electrifies tens of thousands as a sought-after speaker, and she speaks in colleges, churches, conferences all over the country and has shared the stage with renowned speakers such as Lisa Nichols, Laila Ali, Paul C. Bronson and Steve Harvey. Most recently, she appeared on Centric TV's “The Round,” delivering a dynamic and empowering talk on success. In today's conversation, Patrice and I discuss the truth about wealth and why wealth is so much more than money. If this is your first time listening to the Trailblazers Podcast, I want to welcome you. I am so happy you've decided to join us on this conversation today. We’ve actually been in a series on building generational wealth. And we started that off at the beginning of this year with a conversation we had with John Rogers Jr., who's the C.E.O. of Ariel Investments. Terrific conversation and right through we've had some powerful conversations in the series that I would invite you to go back, after you've listened to our conversation here with Patrice today, and fill up on some of this practical wisdom within the series that began back at Episode 101 and coming forward to this episode now. Lastly, before we jump into our conversation here, I just wanted to give a quick shout out – a big up — to Julian Hayes II and Darryl Young, Jr. who both left us a couple dope reviews and 5 star ratings over on Apple Podcast. Darryl, actually his review read: “The show is truly inspirational and much needed. The speakers are dynamic and insightful and the host knows how to carry a conversation. I appreciate the diversity of fields and experiences that are represented on the show. It really is motivational mission fuel.” Darryl and Julian, thank you so much. I appreciate you my brothers for the kind reviews, and I encourage everyone in our blazer nation to leave us a review and a rating over on Apple Podcast right now, and tell us why you love The Trailblazers dot FM Podcast. And so, that said. Let's go ahead and get set to dive in and receive today's mission fuel from our featured trailblazer, Patrice Washington. Enjoy! 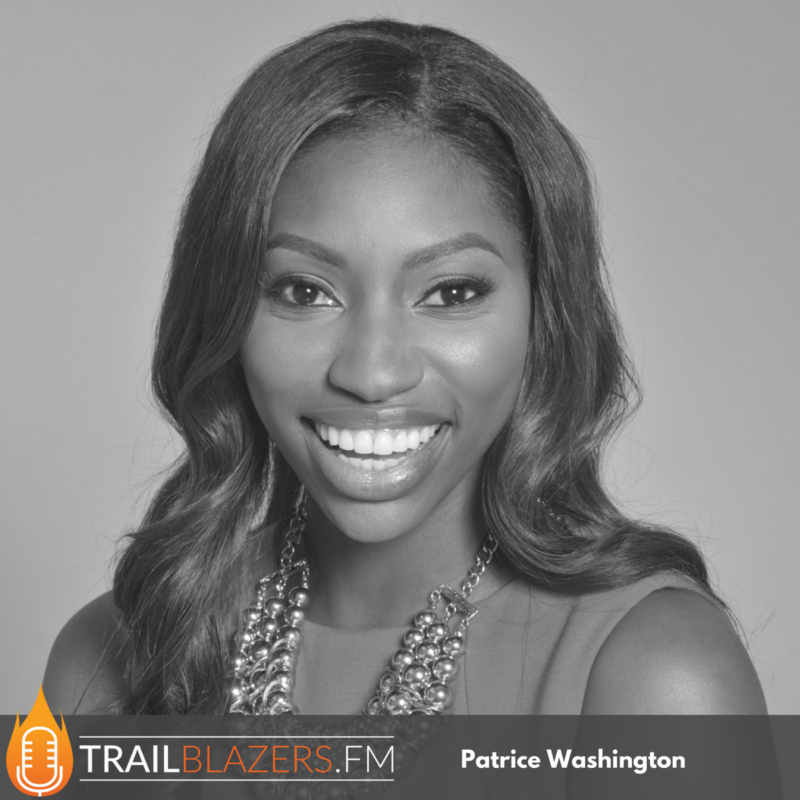 Stephen Hart: Patrice, welcome to Trailblazers dot FM. Thank you so much for being here. Patrice Washington: I'm so happy to be here. You know I manifested this opportunity, right? After listening to your Podcast, after finding you on iTunes, I was like “I want to be on there one day, and then here we are! Stephen Hart: Yes, yes. I'll come clean and I admit that I only learned about you a couple months ago. Since then though, I became a super fan, binging on your content as much as time allows me. And I have to share with you: I know you position your content more so to the women, but I find your message very inspiring. And having listened to your message, I know that you are definitely a woman who expresses gratitude frequently. Stephen Hart: And so I was thinking that, we could kick things off by having you share an unexpected blessing in your life or maybe even in your business that you're grateful for right now. Patrice Washington: An unexpected blessing, well, I will say just this morning I had a call that ended up leading to like 13 speaking engagements this year, so far. Patrice Washington: And one of the things that I share on my Podcast is that there's always someone watching you who has the power to bless you. Patrice Washington: And it’s just about showing up. I interviewed Paul Bronson; I'm sure you're familiar with Paul. Patrice Washington: Yeah, I love Paul, and we were just talking about — at one point — that sometimes people are so consumed, especially in this day and age, with social media. They're so consumed with the number of followers or the number of whatever, whoever is watching or the number of comments. But it's not so much about the quantity as it is the quality; and it's like who's watching. And one of the things Paul talked about was the fact that he didn't have a lot of people watching him on You Tube. But it just so happens that someone from OWN was watching him when he got his deal with Oprah. And I've been getting that lesson over and over again. That confirmation and affirmation has been just coming over and over again, where it's not about being in competition or comparing yourself to everyone else in your space; or what is this Podcaster doing? Or, for me, what is this person in personal finance doing? Or, what is this woman who has a lifestyle brand doing? It's about just showing up every day being the best that you can be and just trusting that as you put forth your best, God is going to do the rest and I just stand in that every day and then yes. So, today I had an unexpected blessing. I thought the young lady was calling me about one speaking engagement, and it turned out to be potentially 13 — 3 guaranteed and like literally throughout the day we've been emailing back and forth about the other 10. So, who knows where it's going to land. But yeah. I just really do. Everything I talk about on the Podcast is what I really do live, and I just stand on that — that there's always someone watching you who has the power to bless you. Stephen Hart: It's funny that you said that. I love hearing you say that in your Podcast, and I love that you share that here with our blazer nation. So, for those who are listening who are maybe not as familiar with Patrice and your story: You’re known as America's Money Maven. You’re a nationally recognized best-selling author. You're a transformational speaker. You’re a Podcaster now, and there are so many other titles, right, to your credit. Stephen Hart: and world's best mom, ever, to your daughter, Reagan. Patrice Washington: I definitely try. Stephen Hart: Patrice, how do you describe yourself when you're outside the business world? Maybe you're at one Reagan's games or you're hanging out with friends. How do you tell people about Patrice and what you do? Patrice Washington: I always say that my mission, I feel like I'm really here just to restore hope to people in the area of personal finance but really in their lives as a whole. And I always just use my own testimony to help do that, and I see that as the entryway. But as you can tell from listening to my Podcast, I'm more than money. And it took me a while to really embrace that. You know. And so, when people ask me what do I do. I’m like I'm just here to restore hope. Like that it. I'm here to share my story and say, “If it happened for me, it could happen for you, because I'm not special; and I don't believe that God is any respecter of person.” I think that the laws and the principles are universal and if we’ll work them they'll work for us. And so, I'm just here to kind of underscore that message. But really, even when I’m at a game or when I'm at something, to your point, I'm Gerald's wife and Reagan's mom first. And it's funny because sometimes people will recognize me. Like I just went to a birthday party the other day and the man was like hugging the birthday woman, and he looked and he's like were you on The Steve Harvey Show? I was like dude; finish your happy birthday speech. Like yeah. But I'm here to support my girlfriend. You know I mean? Like, I'm very grateful for what I get to do, but I really don't do it for that purpose. I feel like God put it on my heart to get a message out to the masses. And I'm willing to do that by whatever means come to me that are in alignment and integrity with who I am. But I'm not hard pressed for that. You know what I mean? Like, I'm not one of those people like, “oh let me tell you about me.” I don't really care for that. Stephen Hart: Yeah, and I connect to that in such a big way. So, the thing I love and for everyone listening, first off, Patrice has a Podcast called “Redefining Wealth” right? Patrice Washington: Yes, “Redefining Wealth”. Stephen Hart: You guys have to subscribe to her Podcast. I’m geeked out about her content. She's amazing on it. The first 5 or 6 episodes she goes in and opens up about her personal issues. And one of the things that I love that you poured into was your own self-confidence and self-worth challenges and you talked about not being able to look at yourself in the mirror until you're 25. And I have to commend you for the transparency, that you're being so open in sharing that. Because I can only imagine the women that would have been impacted by you being so open about that struggle of yours growing up. And as I process that, I wonder how you go about cultivating a belief, like a 100% belief in yourself today, on all sides. Because there's not just a switch that you flipped and now you're fine, right? Stephen Hart: It’s a process, right? Patrice Washington: It’s a process. Stephen Hart: And it's on all sides: mentally, physically, spiritually, emotionally. So how do you go about doing that? Patrice Washington: Well, you know what, when I committed to doing Redefining Wealth, I was very clear that it could not be another personal finance show just about money, right? Because I don't even believe that personal finance or wealth building is all about money. It's so much about more parts of who we are, and the reason that people chase money unsuccessfully is because they don't take the time to cultivate these other areas. And so, if you're going to teach from that perspective, you can't be surface. Like, I just felt like you can't be like, “oh look at me going from glory to glory, and mountain to mountain” without really opening up and sharing how you've overcome these different areas to build the wealth or success that you have. And so, the first pillar Redefining Wealth as you know is about being fit, and it's about becoming your best self. And what you basically alluded to is where I talk about the fact that in order to build wealth so many of us don't recognize that our fitness plays a big piece. Because we're praying for God to enlarge our territory, and we're praying for more money and more success and possessions or more of whatever you're asking for. But a lot of us are not protecting the vessels. In doing that we're on this hustle and grind and work 24/7, and we don't sleep, we don't rest, we don't take care of ourselves, we don't eat well. And it's like, how can you expect to walk into such a big vision, if you're not protecting the vessel that's needed to get to the vision? And that's not about being skinny, because I've been relatively thin my whole life and had high blood pressure and a bunch of other stuff I couldn't even pronounce to you at this point. Like I learned about all kind of things that had nothing to do with my weight, but I was sick inside because I wasn't taking care of myself. And one day I just woke up. I got the audacity to keep praying for this national book tour and I'm praying for this and praying for that, and I can't get up and down the stairs without huffing and puffing. Like, real talk. And yeah, I look great in skinny jeans, but so what? Like, what does that matter in the big scheme of things? And so, I realize what an issue that is for so many of us, especially for entrepreneurs and those of us who are blazing different trails. We get caught up in that, and then we don't take care of ourselves — not only physically but also mentally. And one of the biggest things that I credit with my success today was going to sit on a couch and talk to someone about my childhood trauma. And I tell people all the time that it doesn't matter how much education you have, how smart you are, what school you went to, what degree you have, how many wonderful jobs you've had, you will continue to sabotage your own success and ability to build wealth if you do not deal with some of your trauma. Like, some of the things we sweep under the rug, Stephen, and we make it so normal. But a lot of this stuff is not normal, you know what I mean? You're hurting, and you don't understand why you show up in the world the way you do. And it's not about having another degree; it's about getting some therapy. And I'm a believer, and I believe you can pray all day and God will send you a therapist that can really help you in the natural. And I don't take that for granted. So, when I look at my life now, when I look at being on The Steve Harvey Show or Dr. Oz or all the shows that I've been blessed to be on; or I look at 4 books with my face on it or being able to stand on stages and speak to hundreds and thousands of people at a time, like I would not be able to do that, had I not dealt with the fact that I grew up feeling very ugly. Because I was told by people in my family that I was ugly. I was the one that was too dark. I was too tall. I was too thin. My lips were too full. My nose was too flat. Like everything that could be wrong was wrong with me. And I was a little girl trying to scrub the darkness off of my skin. And so, it's my husband — between my husband, who was then my boyfriend — and therapy that I really learned to embrace what I look like and love myself. Because I was created in God's image and understand that God didn't make a mistake on me. Had I not embraced that I couldn't be America's Money Maven. How could I? How could I get on TV and allow for the possibility of millions of people to have something to say. Because, you know, in social media now they're quick to talk about you, right. It’s like, how can you stand in that? But I had to deal with that in order for me to have the success I have today. And so, I wanted to be transparent and say that, because I just spoke down in Miami at Alonzo Mourning’s Foundation to about 400 young people. And when I shared that, I can't tell you how many young women — this is 9 to 12th grade — lined up. I had little girls coming to me crying saying, I would never believe that you felt ugly. As soon as you came out I thought you were so pretty. I thought you were beautiful. And so, it's so important for us as women, especially women of color, to share those stories and teach younger women on how they can overcome that or just know that they're not alone. Stephen Hart: Yes. As you touch on that, we're coming up on Black History Month and Women's History Month, both fast approaching, and I’d love to have you share what it means and what it feels like to be a black woman in 2018. Patrice Washington: Man. Well, I will say this; you couldn’t have told me in 2000 that we would still be having so many of the discussions we're having today. And so, as a black woman, it's really frustrating that I do believe what my grandma used to say. Unfortunately, still today, that we have to work twice as hard to have to be on the same stages, to have some of the same opportunities. But if more of us took a stand and said no I'm not going for that B.S. then you know. I feel like that's my responsibility to the women — not only who are coming behind me but who are parallel to me in this industry. That, if more of us said “no” and stop taking B.S. then more of us could get ahead. But you can't talk everyone into that. But I'm not responsible for everyone. I can only do my part. Patrice Washington: So, there's so much work to do. You couldn’t have told me, when I was 18 years old, that this is what we will still be dealing with. Stephen Hart: And you’ve touched on it, I mean our work begins and ends at home, right? That's something that Shawn Dove planted in me. And so, your work, your number one mission, is to point to your daughter. And I can connect to that so well because my daughter Layla is 7 going on 8, and I find some of that happening right now where I'm having to constantly remind her that she's confident, she's smart, and she's beautiful. And so, I appreciate you sharing that for both sides, both for our girls, as well as for our woman and our wives, our moms and our colleagues. Patrice Washington: And you know what, Stephen, I don't have a little boy. The desire of my heart is to have a little boy. But I will say, too, that a lot of times we have these conversations, and they're skewed towards little girls. But I also believe that little brown boys definitely need that affirmation. They need to know that their stuff is special too, and by “stuff,” you know what I mean. Like, that they are also the prize, and that they should be valued and respected, and they should also carry themselves with respect. And so, I mean, I'm down for brown children. I'm down for all brown children, and I can't say that I grew up in a very intentional home. But I do always try to encourage any parent under the sun, in my voice, to just be intentional about how you love on brown babies. Don't assume that they know. Don't assume that they know they're beautiful. Don’t assume that they know they're brilliant. Don't assume that they know how powerful they are, and don't assume that they understand that there’s going to be people who don't like them just because of their annoying thing. And they have to be prepared on how to deal with that and that doesn't mean engaging in people's drama but even teaching them how powerful silence can be. Because I speak in schools all the time and I see just unnecessary fights between young people and folks and oh like you know, that's just how it is, that's how it goes. It's like no, if we were being more intentional with teaching our kids that that's not even necessary, that doesn't have to just be what it is, you know what I mean? Stephen Hart: Yes, yes. Wow. So listen, let's flip the script here. I wanted us to spend minutes talking about and discussing the truth about wealth. And from this conversation started, I've been a little bit nervous if you will because there is some things in here that let me just go on–I want to invite you to help us reframe and redefine our mindset towards wealth in preparation for the episode. You shared with me that you really wanted people to know that wealth is more than money and that what we should be striving for is well-being and that money is going to become the byproduct. And because I know what I just said might be missed, let me go ahead and restate this. So everyone listening let me you’re–on divided here for just a minute. I needed to truly process Patrice's statement, wealth is more than money and what we need to be striving for is well-being and allowing the money to become the by product. Patrice Washington: Yes, you're right behind me, right. Stephen Hart: Yes, some approaching 10 years here and a second we're both of Caribbean, the same we both had a past in mortgages and real estate. And unfortunately, we shared this common thread of both having our deepest darkest valleys around that time of the Great Recession and having that happen after having a taste of money and material things at a young age. And Patrice, personally, I went from the highest of my highs in June of 2008 when we got married to within weeks after a wedding having my business collapse. And I remember the worst of those days being weeks after we had a delayed honeymoon, we prepaid for like $15,000 cruise in French Polynesia and we’re on it's amazing cruise through all these Polynesian Islands and I'm droning in sorrows. I'm on edge; I'm up most mornings at [spp-timestamp time="3:00"] AM talking to attorneys on the East Coast. I'm just praying for way out and in that experience I lost millions. I lost all the material things. Stephen Hart: And unfortunately, I kept the majority of the debts at my edge, everything in a business. And so I went from flying super high to my lowest of lows. And I had to ask my new bride– I struggle every time I talk about this. Who just once proud, I’d promised a million dollar brownstone. Now, I had to ask her to cover rent for a few months which turned into years before I was truly back on my feet. And I never experience anything like that before. Thankfully no one after and it's never easy to share this story but I share it out because from that lowest points in that darkest valley, I learned some life lessons. And one of those life lessons connects to that stage here. So apologies for rants in for 5 minutes but it really important for me to share my testimony here because today my well-being is so much more important than money. And Patrice, today my self-worth is so much more than my net worth. And my wealth today is in God’s promises, my wealth today is in my wife who stuck by me in the darkest valley and went on to bless me by making me a father to two amazing little people. And my wealth is in these conversations that you and I would have and that would go on to impact people in countries that we will probably never visit through this Podcast. Stephen Hart: And so around for 5 minutes sort of full hard though I'm fighting back the tears but I’d love you to hear because you have a very powerful proverb 17 turning point. And I'd love to just invite you to impart to our trailblazers nation on what do you mean when you say “wealth is more than money”. And maybe share your truths about wealth. Patrice Washington: Yeah. I mean, first of all thank you for sharing that testimony. You're fighting back tears. I can't really tell my story even though I've told it on national television and national radio and I tell it on the Podcast. And if anyone gets close enough and talks to me long enough they're going to hear it because I really believe that I'm only here because of my testimony. And I think about around that same time when like you, we had lost everything and our 6000 square foot home foreclosed in Southern California and we ended up in the 600 square foot box in Metairie, Louisiana. And my husband has been taken my daughter out and I found myself on the floor Stephen bawling and crying and asking God why me, like what have I done. I've been a good person and I have operated in integrity, I have treated people fairly, I tried to do everything the quote and quote right way like how did I get here. And there was that still small voice that told me to reach for my Bible. And I think it found me actually. It wasn't like there was nothing in particular that I was looking for. I literally felt that nuts to reach for my Bible and I just opened it. And my eyes found a proverb [spp-timestamp time="17:16"] and is that “what good is money in the hands of a fool, if they had no desire to seek wisdom. What good is money in the hands of a fool if they had no desire to seek wisdom.” And that thing just hit me. It's like you've read something before and it had like no meaning to you or totally like irrelevant and then you read it again from a different perspective perhaps down on your face and all of a sudden it actually opened something up for you. In that moment, I started to really pick apart, seek wisdom, what does that mean like seek wisdom. I’m like but I'm smart, but I went to University of Southern California. And I got a business degree and I emphasize my entrepreneurial studies and I started this business at 21 years old during my senior year in college and I passed my broker's exam on the first try when on average it takes people 3 times. And I start going through all this stuff and the Holy Spirit was like no, no, no you're confusing knowledge with wisdom, not the same education with wisdom. And wisdom is about the application of knowledge do you know when and where and how to use what you know. Well, that shows me in that moment, in the next day, in the days that followed as I really like took all this in. It was just that I had become accustomed to chasing money but not seeking wisdom like not really going after anything else. And I wasn't chasing money because I was a bad person. Sometimes when people hear my little tag “chase purpose not money “, like what do you mean chase purpose or chase money or that I'm chasing money. I grew up in the Hood. I grew up in South Central Los Angeles so I grew up seeing everything that a child should not see from gang violence to ducking from drive-by shootings to prostitution to people shooting of drugs in the allies and all of that. And the only thing that I knew is if I go to school and get a good education like they say on T.V., like they say on the shows that I could get some money and I don't have to live here because I'm not coming back. I tell my mom that when I got my acceptance to U.S.C. 's when I leave I'm not coming back. And I never did go back. Patrice Washington: –is the condition of well-being in other words, happiness or fulfillment. Patrice Washington: And I was like hey, how come nobody ever says that. How come no one ever talks about that and I'm like men, what would it look like to use the wisdom that God is giving me to explore that to unpack that. So immediately, I started a blog a free blogspot dot com. I had known it still up to these days seek wisdom find wealth dot blogspot dot com. I've never taken it down because I always want to remind people that you have to start somewhere. So I never want people to see how nice Patrice Washington dot com is and then try to compare themselves to me at this stage in the journey. You know I'm like I got started with that and it got me a lot of great opportunities. And so when I got started, I was just like man I just want to unpack proverbs and really look at how we can apply this to our practical everyday life. And I just started to share but I'll be honest with you that free blogspot dot com turned into me writing for sites like Hello Beautiful dot com and Black Enterprise. I became a regular contributor for Upscale Magazine and Sheen Magazine. I started to be invited to talk on different radio segments and then after years of that thousands of words written, hundreds of interviews. Then, I got the opportunity to get on the Steve Harvey Morning Show at least to have a weekly segment; that's been about 4 years now and do all this other stuff. But the problem is when all that came and people were starting to hire me Stephen to do things to come on shows or to do segments, I started to get pigeonholed into talking about budgets and credit reports and debt elimination. And while I was building America's Money Maven, the brand on that that's not the stuff that I was focused on in my real life; that's not what I was doing like the pillars that I talked about, those literally were the things that I was really working on. The practices, the spiritual rituals just the ways of being like that's the stuff I was working on, that's the stuff my husband was working on because at the height of all this not only when did we go from a 7-figure business describing of change, my husband took a job at Taco Bell. He went from tailored suits, in travelling first class and doing his thing. He took a job at Taco Bell enough for a couple days for 18 months and while he was at Taco Bell and I was figuring things out myself taking any little add job I could get, the things that we worked on are exactly what I talked about in the pillars. And I got to this point Stephen where I look in the mirror and I was like I promised God that I will share everything that I did. How the heck did I get trapped in only doing these little sound bites? When people ask me how I got off my brother's couch which is why I lain it after living in New Orleans, I was on my brother's couch in 2009 in Atlanta and they said how did you get off the couch. How are you sitting on this couch across from Steve Harvey or how are you on all these shows like what’s the in between. I found myself talking in these little perfectly packaged sound bites because I thought that that's what people could accept. That's your personal finance expert now, like you've written all these books on money and this is what people want. And a couple years ago that starts to do with me was like but that's not what I told you to do. You done got out of order, not got you finances together, you're living good again, you've built this multiple six figure business and my husband has his own seven figure business and we've been completely restored thank God. But he's like you're not telling people the truth like you've got to tell them the truth about wealth. You have to tell them what you've been studying not what you think they want to hear, not what you think is acceptable. And so last year, I just sat back to why you asked me about my transparency. I was like I don't care what people think any more. I don't care whether you think that vision boards and dream journals and affirmations or building relationships that matter and being someone who gives and gives and gives without sliding people's DMs, asking for things you don't even know them. If you think that having [or answering your closet? [spp-timestamp time="00:36:00"]] is crazy which we do and meditation and all these things I’ve met and do with it. I don't care whether you think it works or not or you think that I'm being who who or whatever because at the end of the day I don't live paycheck to paycheck and I don't look at budgets and credit reports all day. This is the work that I do and doing this work and actually walking other women in particular through doing this work is what has attracted opportunities of a lifetime. I didn't ask to be on The Steve Harvey Show every week that was given to me, that was put in my lap. I didn't ask to be on The Steve Harvey Show a couple weeks ago. I thought when his show left Chicago that I was a wrap and then they called me and say can you come back. I wouldn't even know to ask for this stuff that’s how you know it's real. You know what I'm saying. I wouldn't even know what to pray for the opportunities that I've gotten. I just wanted to help people. I just wanted to share my story and restore hope. And I said I was willing to say it or do it in front of whomever or whatever. I didn't ask the woman today for 13 speaking engage. I thought we were talking about one or two. I didn't ask and that's what I want people to get like you don't have to chase every freaking opportunity. You don't have to stab people in the back to get ahead. You don't have to be one of these women like oh I don't do other women. You don't have to show up this way. You don't have to do this. You don't have to not sleep at night. I'm not saying that you don't have to work hard but you don't have to run yourself in the ground and ruin every relationship that you have and neglect that still small voice that is trying to get to you and take a job that's outside of your purpose when you know that's not what you're called to do. Like you don't have to do get rich quick schemes to be wealthy, you don't, you don't. And if you just focus on all these other areas of life where you need to be fulfilled because be clear, lack of fulfillment is what leads to financial mismanagement. Yeah, lack of fulfillment. If you work on being fulfilled like the true definition of well says and all these areas of life everything that she want will be added to you. It will come. And I know that we hear that so much, oh follow your purpose and the money will come and people get tired of hearing that. And I'm a little tired of hearing it because we don't talk about the practical things you have to do to follow your purpose or the work in your passion. Like there are so many other elements of that to have nothing to do with what your gifts are. It has to do with how you're grooming yourself in every area of your life. Like I'm sorry I feel like I'm just going– you see I get so passionate about it. I feel like I'm just here to call people to this awakening of the truth about wealth. If you would stop making it all about money, all the money you want will come to you. Stephen Hart: Absolutely. I love it, love it, love it, love it. Patrice I have about 6 other questions. I know you're deliberate about your focus on women so maybe let's connect the dots for women listening, brothers keep taking notes. Patrice, why do you think so many of our women aren't taking care of themselves and focusing in on their well-being? Patrice Washington: I call it not Superwoman Syndrome but Wonder Woman Syndrome. And I think I need to like really trademark that because I haven't heard anyone else say it. But I've really been looking at this really intensely for like the last several months in particular. And as women, we are so conditioned to take care of and save everyone else but ourselves like I'm pretty sure at this point if you're anything like my husband and you and your wife. I will make sure my husband goes to the doctor like I will make sure that he goes to the dentist. If he says, aw I'm cool in like I'm on it. But sometimes I get in the habit of being like Ouch ouch ouch couple days longer than I would allow for him or my daughter. I'm so focused on making sure that they're cool and I was raised by some really strong single independent Caribbean women who just taught me that you make it work like you make things happen. But so often that comes to our own detriment that we worry about everyone else and we come second and I call it Superwoman Syndrome. It is about going from this idea of women being the homemaker in the 60's and then in the 70's they went from being a homemaker to also working woman who had all this stuff to balance, they say balance, right. But then Wonder Woman, the creator of Wonder Woman this guy said wonder woman should have power and strength and be as strong as a man but have the grace and poise and peace and ability to love like a tender woman. I'm like man you made laying it on thick, this is a lot. And in our society, we have all these expectations of women but what I run into so often is that these expectations make women suffer in silence like it’s okay for us to say, I can't take any more. Like I'm tired, being your personal A.T.M. is wearing me out. Like it's hard for us to say no and to commit to not letting other people's lack of planning be our emergency because we're the ones in the family that have made it, we're the ones that everyone comes to for advice, we're the ones that everyone depends on but then where do we go. Even as a strong woman myself who has a loving and supportive and indulgent husband sometimes because I was raised by single women I have to remember that I don't have to be who they were, like I do have a helpmate as well. I do have a partner in this and I don't have to shoulder everything. I don't have to be America's Money Maven and then world's best mom. They even let me off the hook. I don't even cook Stephen like that's not what I do. It is not strength of mine at all. My daughter told me one time like mom we love you, just stop, just stop this is not what you do. Stephen Hart: Did you and Gerald read “Drop the Ball”? Stephen Hart: Oh my gosh like I have Goosebumps right now. You have to bring Tiffany Dufu on to talk about it. You have to buy her book promise me you buy her book. Patrice Washington: “Drop the Ball”, okay. Stephen Hart: “Drop the Ball”, this is exactly what Tiffany is talking about. Patrice Washington: Oh good. That sounds good. Stephen Hart: You're going to love it. Stephen Hart: And so much in perspective for me because I think in my head, I think I'm being an active dad when you woman are doing like you know double or doing and more. Stephen Hart: And my wife said so much of that to me and I realized through reading this book how much I was not being involved in so much. I just assumed that she had a couple you know. Patrice Washington: Yes, because we put on but that's the thing. So this is your tender, sweet, loving, beautiful wife and then you still see her as this strong and powerful and amazing woman who can make everything happen. And so in keeping up with what that persona or perception is we get lost sometimes. And one of the things you talked about like I think you asked me a bit about how you kind of focus on this every day because you're always evolving right. Like one of the things that I have on my altar is this little card and in my closet it says, Dear Patrice surrender, thanks God. Patrice Washington: And I look at that every day and that was actually my word. I was on a show on Centric by BET called The Round and we each other had a word it was like a TED talk for empowering black women and my word was “surrender”. And every day I have to remind myself that I don't have to walk around trying to balance. I don't even believe in balance. I believe in harmony. But trying to balance all these things and keep escape on and do all this stuff like it's that reminder that I can ask for help. I can say I don't know what I don't know. I can't opt like it's never been a time when I asked my husband for help and he wasn't like oh okay. But he was so used to me for so many years acting like I could balance it all and stressing myself out when I had to do is say hey you pick her up. She's yours too. You're not babysitting he’s your child. Nobody says I'm babysitting her right like that’s your kid like you do and he's like oh okay. It's like no problem but we don't even know. And so the women that I work with– and really I focus on women Stephen just because I am one. I've never been anything else and I just feel like we speak the same language. But I'm very grateful because I have a lot of men that enjoy “Redefining Wealth” they tell me all the time. But I focus on women in particular because I just know what it's like to have this public persona and to have this great title and career and publicly you look wonderful but behind the scenes you're falling apart. Like behind the scenes you may be emotionally, physically, spiritually, mentally, just bankrupt. And people think because you have the title or the house or the close or the nice car or the husband or the cute kids or whatever, that everything is okay. And it's really not and it's really hard for a career woman who has the title, or a solopreneur or a small business owner who looks like they have it going on. It's really hard and it's embarrassing and you feel guilty and you feel ashamed when you look at yourself and go: But how can I have such an awesome public persona and feel this way. How can I have such a full life and yet be so unfulfilled behind the scenes. Like how have I let myself become a public success and quietly a private failure like deep down and it wouldn't make sense to anyone else. And the women that I support when I just want them to know that I feel you, I hear you, I see you, I understand what that's like and the answer is not another raise or promotion. The answer is not adding more products to the catalog. The answer is not so many of these things that we look at on the outside. It's us really getting clearer on the things on the inside we have to work on. And man, I'm telling you do, when you stand in that it’s like the whole world opens up. Patrice Washington: Oh man, that was so good. I can't believe we’ll leave by that quickly. Stephen Hart: We'll have to do a part 2 on this. But before we let you go, there are a couple of questions that our trailblazers would love to tap into–the resources of our guests. And I’d love to invite you to maybe share any good books that you've read recently and would maybe recommend to our blazer nation? Patrice Washington: Well, one book that hasn't yet come out but it's coming. I'm reading it now because she's going to be a guest on my Podcast Marshawn Evans Daniels-“Believe Bigger is Amazing”. So for anyone who's really working on their purpose but then aligning their purpose with every other area of their life. It is so funny it's like for such a time is this so many people are rising up with these messages that coincide. So that's one for me a great one right now and also “Wealth Can't Wait”. I don’t know if you've heard of that. “Wealth Can't Wait” it's by David Osborn and Paul Morris. And these guys are like in the color Williams family but own hundreds of properties and it's funny you would think that the book is all about money. But I start digging in and it's like a flip version of “Redefining Wealth” written by two white men. It is incredible. It's incredible. So those are the two things on my desk right now. I love to read books simultaneously. Oh and then “You're a Badass” by Jen Sincero. I'm also reading that which is also awesome. Stephen Hart: Love it, love it. I have to get my Paul Brunson game on and start reading like three a day. So the last question for you and we'll wrap up here. What's one action that you think our community should take this week that going to help them to blaze their trail? Patrice Washington: One action you can take this week that's going to help you blaze the trail. Decide that you're ready to be wealthy. Make a choice, everything comes with a decision. And I believe that decisions come into form. Some people make a decision and they're interested in it and some are committed to it. And people who are interested in it will listen to this interview Stephen and I'll be like oh okay that was nice and they’re way for your next episode. But people who are committed are going to take whatever nuggets they come out of this and start to apply it immediately whether that's taking care of themselves like taking a freaking nap, going to sleep, eating when you should, what you should, signing up for therapy or getting back in whatever routine with your spiritual practices it's like too many people are interested it sounds nice. But “Wealth Is A Choice” that's another great book by Dr. Dennis Kimbro who's also a mentor of mine like wealth is a choice. You get to choose which you're going to be interested in versus what you're going to be committed to. And if you're committed to building true and lasting wealth then you'll make a choice to stop making everything about money because that hasn't worked and start diving in to the other pillars, the pillars that matter the most. Stephen Hart: Yes. And you [unintelligible [spp-timestamp time="00:49:59"]] up perfectly. Tell our listeners about your Podcast and how they can stay connected with you? Stephen Hart: That’s right, that’s right. Patrice, thank you so much. I appreciate having you on and share this amazing conversation with you. Patrice Washington: Same here. Thank you so much, thank you so much.